A few months ago I gave myself a challenge: get dressed in something other than yoga pants for 30 days straight. I did fairly well, and managed to get dressed in real clothes every single day of that challenge (and have continued since). Much of what I wear, probably 75%, is thrifted. A lot of readers noticed this during my 30 day fashion challenge and asked me to share some of my thrifting tips. 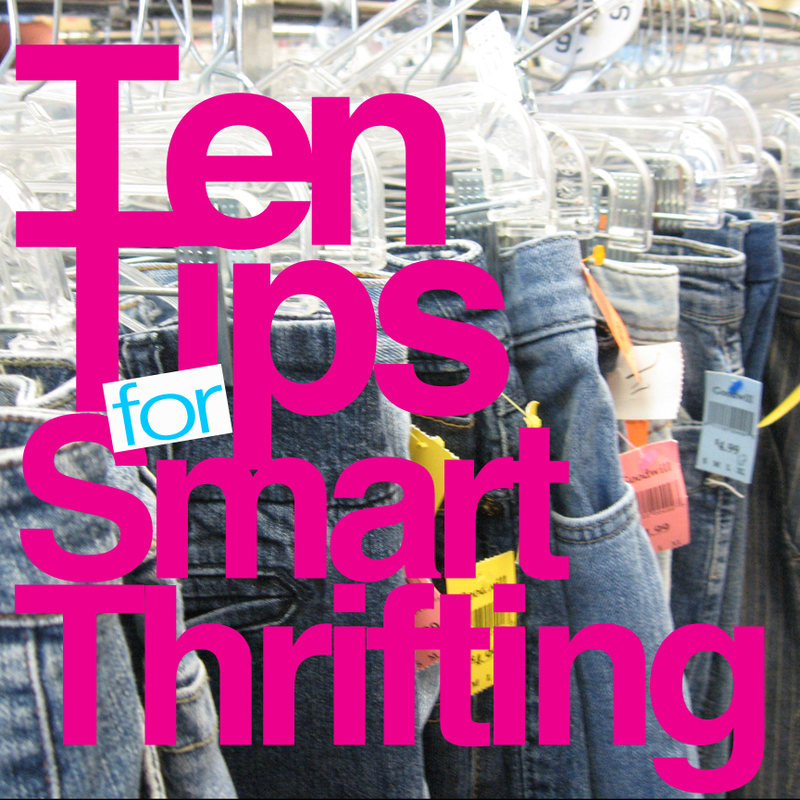 Here are my ten tips for smart thrifting. 1. Find the right store for your particular needs. 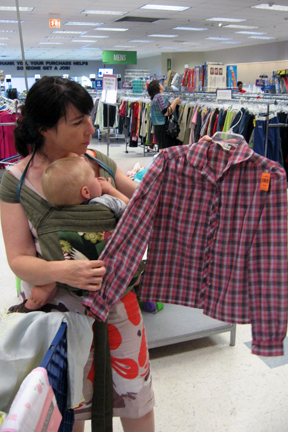 We go to most of the thrift stores in the area to get a sense of what they offer. We find out which ones carry good prices and clean inventory on things like furniture, kitchen ware, baby items, clothing, electronics, and books. Some thrift stores have great prices on clothes but poor prices on furniture; we make note of these particulars and keep them in mind when we’re making our rounds. If there’s something we’re looking for, like a piece of furniture, we’ll skip the ones that have outrageously priced used furniture and head to our local Savers. They always have good prices on furniture (but not so great on clothing). We found this vintage armchair for 20 dollars last week. Score! 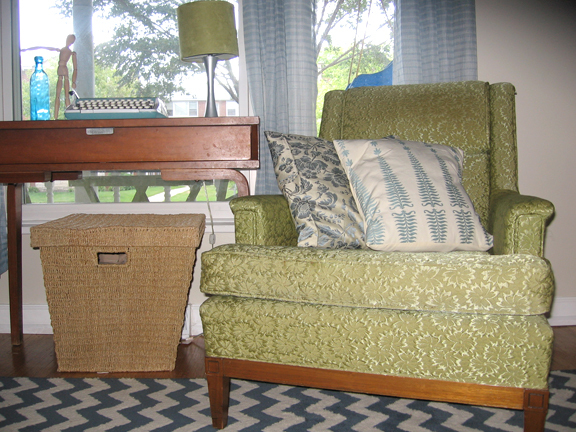 My new vintage armchair works perfectly in my living room! 2. Go often. For any good find to be had you have to be there at the right time. Visiting your local thrift stores frequently helps ensure that you’ll find that diamond in the rough. Peter and I make a point to go to our local thrift stores about once a week. We don’t always need something when we go, and we don’t always make a purchase, but we always enjoy our venture out. A quick once through the store to see if there’s anything that looks like a winner – meaning the right item at the right price takes no time at all. 3. Make a quick sweep through the store. Walk quickly through the main departments of the store. Scan through the aisles, as you do pick up what you like and place it in your cart. Don’t worry, you won’t be buying it all, hopefully! This quick run through helps you find any stand out items right away before someone else does. 4. Find a specific section of the store that you’re interested in and focus your time there. Once you’ve done your quick sweep through the store, making sure that you didn’t miss any golden opportunities, focus your time in the place that you enjoy the most, or need the most. Maybe that’s looking at household goods, books, or baby items. You decide. And when you come often you can easily spot what’s fresh on the store shelves. 5. Don’t waste time by sorting through clothing racks. This is the one thing that has changed my world as a thrift shopper. 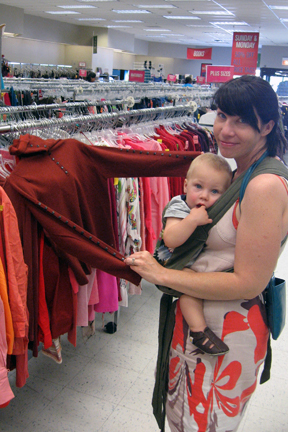 A lot of people will tell you the one way to find good clothes at thrift stores is to go through each clothing item on the hanger one-by-one. I disagree. Let me explain further. With jeans, I know I love a wide waist band and dark denim. I don’t have to look at every pair of jeans on the rack to see which ones have a wide waist band and or are a dark wash. I can see those details as I walk through. Additionally, I may also slowly walk my fingers across the rack of clothing to get a sense of the texture of the clothing. I like worn cotton and soft linens. My sense of touch tells me when I found a winner just as much as my eyes do. 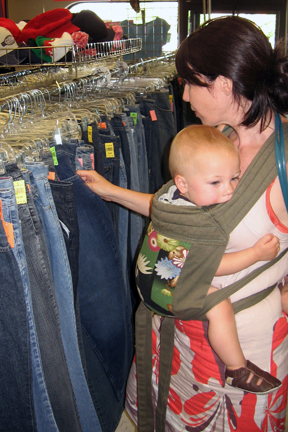 Scanning the jeans aisle with my son in tow. 6. Know your size and fit, and skip the dressing room. Unless absolutely necessary, I don’t try on clothes. You may think that’s a pricey mistake to make (potentially) but I’m okay risking it – especially when I know the return policy of the store. I have learned which brands fit in what way. I know when I see Gap “Curvy” jeans, which size is good for me. Likewise, I also know when I see Target brands which fits run big and which ones run small, and I make my choices accordingly. I only go to the dressing room when I really need help figuring out if something is worth it or not, or if I am really stumped on the fit of an item. Scanning the women’s shirts, I found a color and texture that I like, so I pulled it out for a closer look. Unfortunately, it wasn’t right for me. 7. If you must use the dressing room, dress with quick changes in mind. There was a time when I always tried everything on. That was before I shopped with children. Now my time is too valuable, and my children don’t have the patience to wait on mommy while I sort through ten different items in the dressing room. If you can’t give up the dressing room, I suggest you dress with simplicity for your thrift shopping adventures. Slip on shoes and a tank dress were my go to uniform when I was shopping for clothes. I could try on jeans without even taking off my dress, and I would know just by the way the jeans hugged my thigh if they fit right or not – that move takes all of ten seconds. 8. Sort through your items at the end of your shopping experience, not during. When we’re finally ready to go, my husband and I meet together and pow-wow over the items that are in our carts. We show each other our selections, ask each other what our opinions are on things. We talk about the price of an item, its value to us, and then we glean through and get rid of anything that doesn’t keep our attention or affection. We always try to put everything back that get’s vetoed, however for clothing if we can’t remember where we found it, we place any unwanted items on the rack outside the changing room. Sorting through the items in my cart. This shirt didn’t make the cut. I already own too many like it. 9. Sign up for the mailing list and get the membership card. A lot of thrift stores have special sale days like 50% off the entire selection in the store. You’ll know about this deal ahead of time by joining the mailing list. Many thrift stores will offer a discount card offering deals based on how much you shop there. Some thrift stores even offer a shopping discount if you donate items, so be sure to know what perks are available to you. 10. Make friends with the owner and shop workers. Keep the store’s number in your phone and call in if you’re looking for a specific item, this can save you a trip. Also, don’t be afraid to ask when new furniture gets placed on the floor or when amazing donations are made that highlight certain items you’re looking for. Being a loyal customer and getting to know those who work at the store are good ways to get inside information. I hope my thrifting tips help you in your own second-hand shopping journey. Now go out there and find your bargains! P.S. For the time being I’m taking a Facebook break, so if you would like to comment please do so on the blog (and not on Facebook) so I can see your thoughts. Thanks! Awesome tips! I do most of those already — especially scanning the tops of clothing racks. But I have said it once and I will say it again; bigger women don’t give up their clothes! I am definitely a plus size and I can count on one hand the times I have donated good, cute clothes to a thrift store. I usually wear something until it literally falls apart. I am pretty certain other curvy women do the same. If we find something that A) fits and B) looks good, that item of clothing will never go out of style.